More than five weeks after my mother's death, I find that grief triggers hide everywhere, even where I wouldn't expect one. Today there were several, some obvious, some subtle. At a birthday party for a friend's children, I realized the birthday siblings are blessed to have four living grandparents. Four grandparents. Something my children never had. Then at the mall, I walked through a few stores that had petite sections. Mami was the only person for whom I've ever bought petite clothes. At 5-feet tall, she couldn't easily wear regular-sized apparel. I walked by the petite areas wistful, sad that as the holidays approach, there's no reason for me to look at the lounge suits and pajama sets she favored. Later on I looked at the kids, cold from being slightly under-dressed for the evening's chill, and I heard Mami's voice admonishing me in my ear: "They're cold! You should've brought their heavier jackets!" And that's the way every day is, with its ebb and flow of reminders that she's gone but not forgotten. The picture I've included is from one of the happiest days in my family's history. 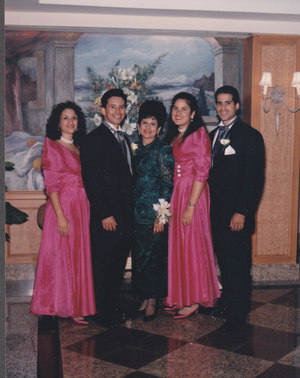 It was my brother Louis' wedding in fall of 1994. I was a first-year adjusting to life at Columbia. Diana, my sister, had just announced her pregnancy -- the family's first grandchild was on her way. Jorge, our late aunt Ele, and our stepsister Patty were there to celebrate too. Mami's hairdo ended up a bit too beehivish for my taste, but she looked stunning and radiant. My sister-in-law's father had died just two weeks before the wedding, so when it was time for the parent dances, everyone at the reception was incredibly emotional. Louis and Mami danced to Bette Midler's "Wind Beneath My Wings." I know it's widely considered an extremely cheesy song, but watching Mami and Louis sang, the tears, the love, the bittersweet joy was real. At some point the photographer took this photo of the five of us. Cancer was still six years away, and it was a beautiful moment.